The weekend of July 7th and 8th in Michigan brought beautiful summer temps that were not too hot or humid, but JUST RIGHT...God truly smiled upon us last weekend. After 2 years of preparation (not to mention the LAST MINUTE CHANGES...), the Jackson/Mayes 5th Family Reunion was great a success! The Jackson/Mayes Detroit Experience was big fun and new relationships were forged. Family members joined the Michigan Host Family from Georgia, Florida, New York, and Colorado. There were so many surprises!! Who knew so many of our family members of every age could sing so well!! Move over American Idol...WE ROCK!! Our family sung unique renditions of the Motown Classics and our kids sang very spirited tracks from Disney's High School Musical kareoke CD. The surprise appearance of a certain family member who had been so instrumental in jumpstarting the Michigan host family's planning efforts for this year's events after it was confirmed that she would not attend, pleased us beyond measure. 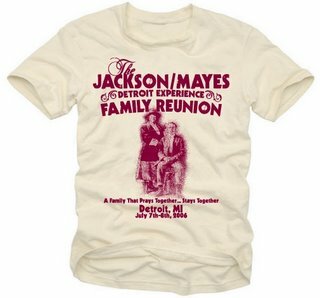 Romain Blanquart, Time Magazine photographer, was like family for the entire weekend's festivities as the Jackson/Mayes Family Reunion was chosen through the Detroit Visitor's Bureau Convention as the family reunion to be covered from Michigan. Time Magazine will feature a story-- some time this year-- about the family reunion tradition among African-Americans. Just like the prayer for wonderful weather was indeed answered for our reunion dates, the family is now praying to actually make the final cut and be featured in Time Magazine. Join us in prayer on this one...would you??!?! Special thanks to Sheila Smith of Southfield Hilton--not withstanding the shuttle incident, Shawn Jones Kitchen and Bakery--ample supply, but kick-up the favor a notch--BAM!, Gerald Butler--your kareoke machine was magical, the entire Host famiy--AWESOME TEAMWORK, and each a every JACKSON/MAYES family member--we couldn't have done it WITHOUT YOU! !